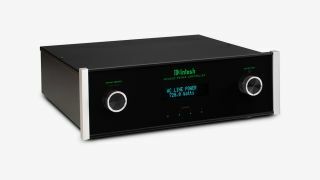 McIntosh MPC500 will protect your hi-fi gear against lightning strikes | What Hi-Fi? It's a nightmare scenario: your system is all running nicely until one day an electrical surge wipes it out. Well that won't be a problem if you have the McIntosh MPC500 Power Controller. The MPC500 protects your mains against electrical inconsistencies, i.e. sudden surges caused by a lightning strike, equipment fault, load switching or something similar. It provides full mode AC power line surge protection as well as protecting low voltage devices against secondary surges and spikes that can occur after the event. On AC power line protection duties are three thermally-protected metal oxide varistors, which are safer than standard metal oxide varistors. They provide Line to Neutral, Line to Ground and Neutral to Ground protection. The MPC500 also protects Ethernet devices, coaxial and other low voltage devices. The MPC500 has electromagnetic interference (EMI) filtering of the AC line and over/under voltage protection which switches off the rear receptacles to keep connected devices safe from operating at undesired voltage levels. It's available with either eight Type B (NEMA 5-15R) or four Type F (CEE 7/3 or 'Schuko') plugs, depending on the region where it is sold, and comes with the familiar McIntosh style and design. It costs $2,500, so it's fair to say you need a serious system to justify the outlay.